Over the weekend I was disappointed to find I wasn’t to be ready to take the variation of the detached cable stitch off grid. I attempted some off grid work with it, but it didn’t hold up. For me that usually means one thing, I haven’t spent enough time with a stitch in school girl exercises to understand a stitch’s limits and capabilities. As a result all of samples in today’s post are experimentation on a counted ground. In the first sample I did a comparison between the detached cable stitch and the variation of it that I’ve been using. I love the solid feel of the detached cable stitch couching on the left. 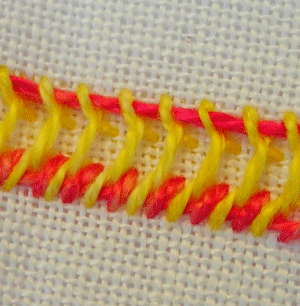 The middle couched thread in this sample rests on the detached cable stitches. The middle couched thread in the variation rests on the fabric. It is wider, flatter and more flexible. Here are the other samples–nothing outstanding. Basically all are various tests about what I could do with the stitch. I did get rather carried away with working a mirror in the same holes as the original. I also did a variation on the variation by moving off the straight line with the beginning of the third stitch. (If interested you may see this post for the step-by-step where I use these terms). I forgot that I tried adding detached chain stitches to the ends of detached cable stitch. It can be done very fast in one continuous action. Next scheduled post: Saturday (us, west coast). My original header photo is still missing in action. I had to create a substitute. I suppose this is a lesson for me that some photos need to be titled more appropriately so they may be found more easily when needed. And who knows what the original color of the text was–another lesson. UPDATE: Sorry to have had to move next scheduled post to Monday (us, west coast) due to unexpected work situation. Earlier this month I did a couple of posts (here and here) on a design I stitched. The piece seemed out of balance to me. I started working on the balance with scissors, paste and a lot of great ideas from those of you who stopped by and left comments or sent me emails. The input was encouraging and eye opening. I’ve learned and am thankful for every bit of it. Some of you will recognize your ideas being implemented below. Many thanks to each one of you. I only wish I was a more apt student. This is what the design looked like in that last post. There are four versions of the designs that I’m planning to stitch. I’m only putting two of them in this post. If you don’t see some of your ideas here, they are no doubt in the other two versions. My printer’s quality and getting good photos of cut and paste work combined against me on those. And these two I’m posting are extremely poor. Still they are a rough idea and when I squint, I can live with them. In the photo above is a change of orientation. The flowers and scrolls are positioned horizontally instead of vertically by rotating the design ninety degrees counter-clock wise. Once I did this the orientation of the original motif at the top right and lower left were sticking out like sore thumbs. So I change their orientation to vertical instead of horizontal and placed both in the same rather than opposite direction. More symmetry was added by repeating the floral shapes and scrolls on the lower right. And then I still had the positive “b shape” to deal with. It was hard to let go of that shape, but it has been removed from the right side. In fact it is so hard to let go that I’m thinking of stitching or beading that shape along the narrow left and right blank border areas. On the left from the line extended from the top of the center area to bottom margin. And on the right from the top down to the line extending to the right from the bottom of the center area. Today I was showing someone the work on this design. They were stunned at the difference in the design caused by the change in orientation of the positive “a shape”. These are the rows/columns of over-dyed orange shapes on the left and right of the center area. Changing one thing easily leads to another. Making one change may lead to an unintentional change that is either a happy coincidence or another aspect of the design to played with. Below is the next version and an one hundred and eighty degree flip. Here I widened the left and right borders. I’ve played around with making both sides as wide as the center. But I couldn’t do it. The idea might grow on me if I play more with some of the other aspects of the design. One thing I want to do is extend the black scroll line along the bottom to the left margin. I was going to block out the last row of green stitches. But I want to leave them and work the black stitching between them. I think doing these two things may anchor that part of the design so that it doesn’t float so much. In this version the number of positive “b shapes” declined/increased to lead the eye along to the second group of flowers. This is one of the suggestions that came in via email so you won’t see it in some of the comments. Many thanks to this kind friend for this idea and I’m not sure about how many others but a lot. I’m also trying to decide about the placement of the flower and scrolls on this. Some times I want to pull them a little more away from the center and add more scrolls to connect the inner flower to the scroll framework more directly. At other times I think the only thing I don’t like is the outer flower. Would I be happy, if I just changed the petals a bit? What do you think? Any further suggestions? Things are glued down but I’m still open to more cutting and pasting. On another note, my header photo is still lost. I wish I would find it soon! Congratulations to Sharon b on the opening of her new blog at Pin Tangle. If you haven’t had time to take a look at her new blog, please do swing by. To check out what she’s planning to do and how the new blog works, read her “A New Broom” post here. All her great posts from the past are over there, too. I must say that new broom is kicking up a bit of dust at this blog. I’ve attempted to change the major page links. And, oops, in the process I deleted my usual header. I hope the header will be back by Monday (us, west coast). However it will be a few weeks before all the post links to Sharon’s material are updated. At the moment they may refer you to her previous blog or fail altogether. Please bear with me as I work on this. If you notice any major links that I missed please do leave me a note via a comment. I will appreciate that help in settling the dust here. Here is a quick tutorial on a detached cable stitch variation I mentioned earlier today in an post showing stitched samples. The one draw back to this photographed step by step is that is hard to see that I’m working in one straight line on this sample. So when viewing the photos keep in mind that although the needle and stitching thread are sometimes hiding it, I’m working everything along one horizontal thread. I started over four threads back two threads. Please note the thread for the middle stitch may go over the first stitch or below it. I think the major thing is to be consistent so that both ends of the middle stitch are the same side of the first and third stitch. The step below is why I consider this a variation of the cable stitch. I think if I were doing a normal cable stitch, the point of the needle would be coming up at the same place the first stitch ended. 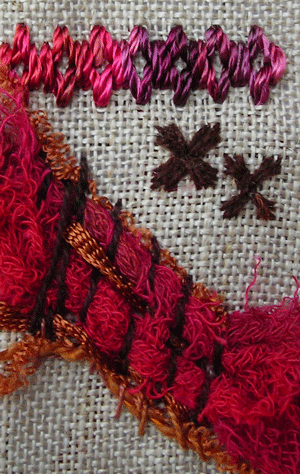 The cable stitch is a great stitch as well as the chained border stitch. Neither stitch should be confused with the cable chain stitch, although perhaps some connection may dawn on me sometime later. I think a detached cable stitch would be fun to experiment with. It would allow a height variation for a center couched thread. I’m excited about the possibilities for weaving and interlacing as well. This next step shows the middle stitch pulled through and the start of finishing the third stitch. If you saw the early sample post, you’ll already know that I experimented with a lot with variations for the first and last parts of this stitch. It’s a quick stable stitch so there is a lot of room for play. I think the stitch I’ve been experimenting with would be a variation on a detached cable stitch. But I’m willing to be corrected. Sometimes it is so hard for me to choose the right category. I started making it because I was playing with the half chevron stitch and it seemed like a flat half chevron to me. Regardless of the name, I’ve been having a lot of fun with it. These are my school girl exercises using a 100/3 silk thread. Not much to look at. But look what happened when I moved it over to into a pima cotton and played with these variations. I want to take this stitch off grid as soon as I have time. There are several places to couch other threads in any of these variations. Some of them would be suitable for lacing or interweaving as well. In the samples below I did couch some threads as well as adding straight stitches to some of them. I’ll do a quick tutorial on the stitch itself in a separate post later in the day. You are currently browsing the Quieter Moments blog archives for November, 2008.